Welcome, friends! About a year ago I shared our tattered bar stools (well the seat anyway) and how I was looking at different stools to replace them. 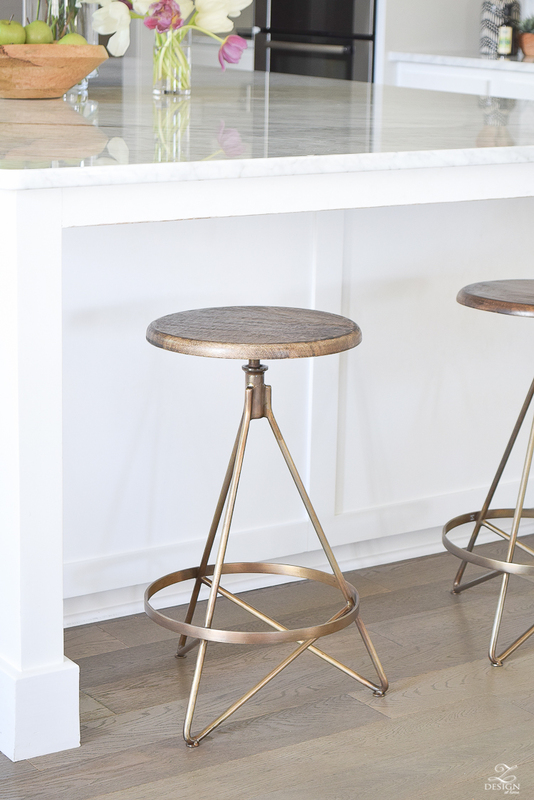 To get you up to speed and if you aren’t familiar with what I’m talking about, please check out my post from last year HERE where I talked about my bar stool dilemma and gave several basic tips for selecting the perfect bar and counter stools. To give you a visual, here is a photo of what we had before the recent replacement I am about to share. 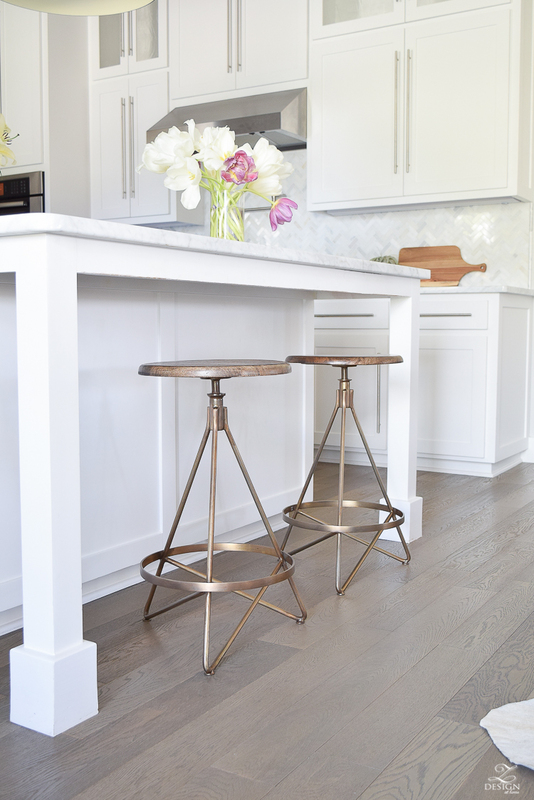 I loved these stools and really loved the way they popped against the white kitchen but was craving a more modern look for now (plus the bottom was blown out of them so they were long over due to be replaced). And here is a sneak peek of what we have now…I’m completely over the moon about the choice! 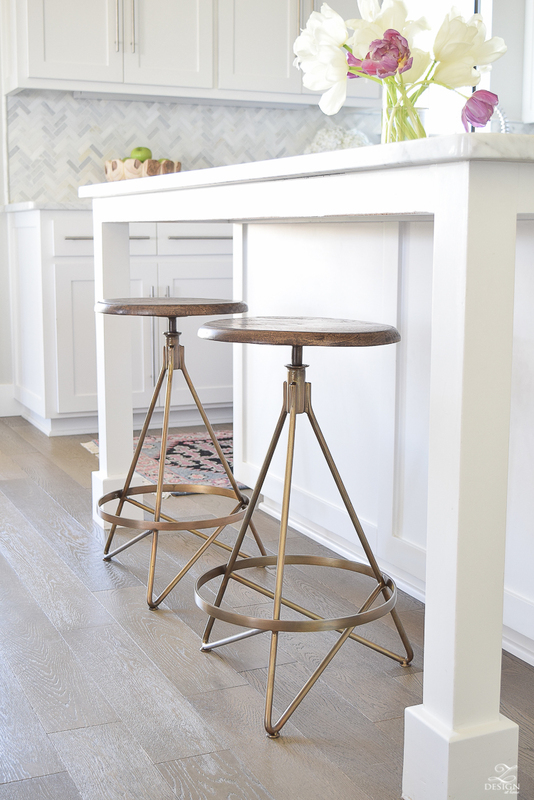 It took me long enough but I finally feel like I found the perfect stool for this spot and I’m excited to share them with you! At the end of my post stay tuned because I will also share several other stools that were strong contenders in recent days. We really needed something without arms (you can see that paint touch ups are in order from the previous arms bumping into the island) and also knew that something that swivels would be nice as well since our casual dining space and TV are in the opposite direction of the kitchen. I searched high and low for over a year and ultimately landed on this beautiful bar stool from Wayfair.com. 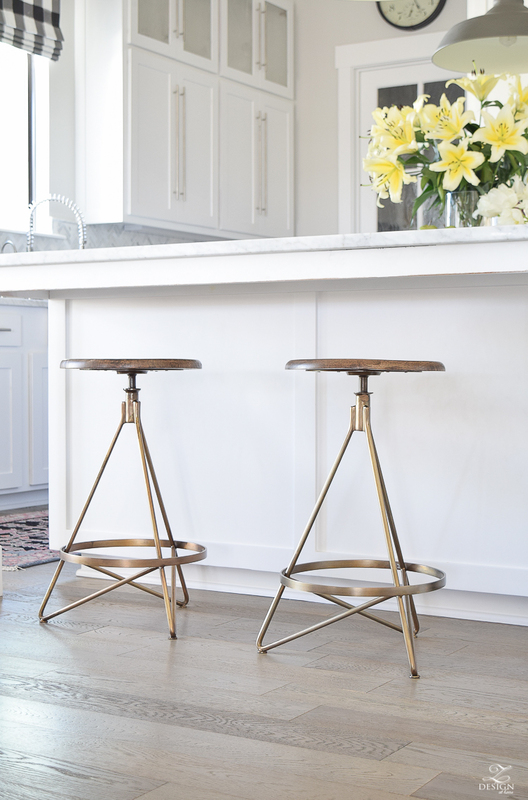 I love the graceful curves of the contemporary brass legs on this stool but really also love the juxtaposition in materials between the wood top and the brass. 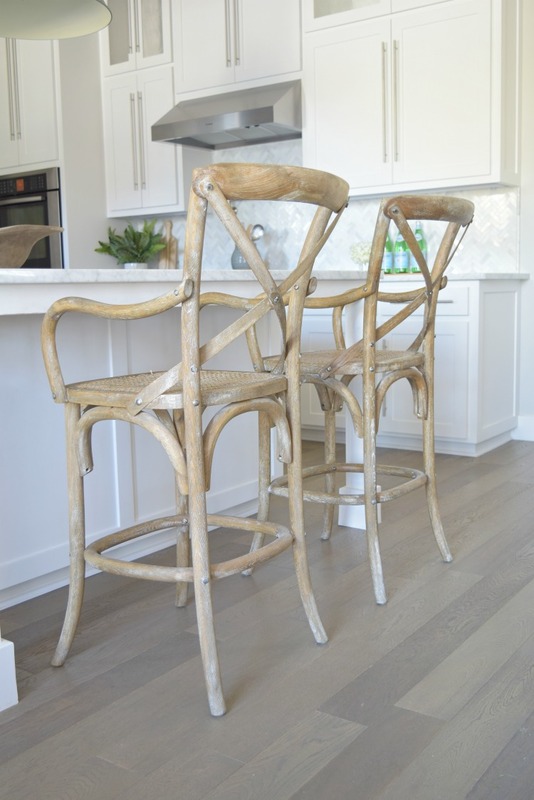 The wood tone also blends nicely with our adjacent dining chairs and pops gorgeously against the white cabinets and counter top. I was so worried that having a lower profile bar stool here with no arms would feel sterile in this spot but these beauties have turned out to be just the opposite! My husband was out of town when they arrived and he immediately fell head over heels when he walked in the door and saw them for the first time. Now I’m curious, what do you think? 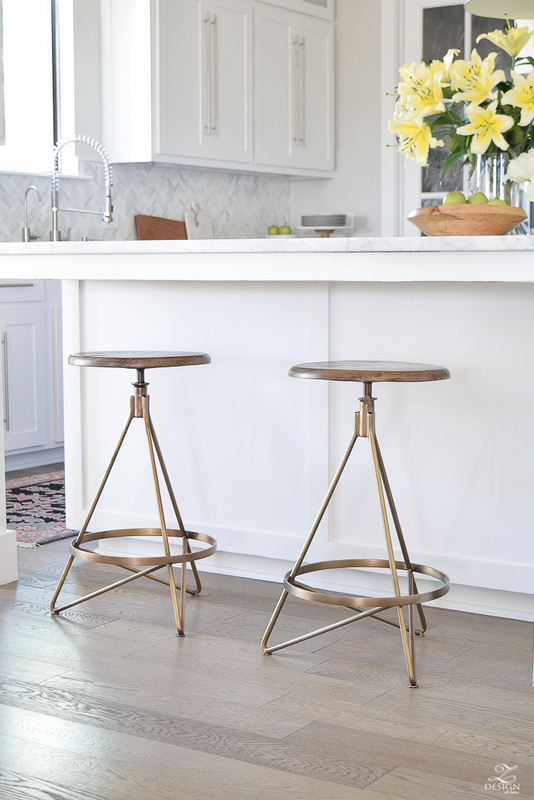 The brass legs on these stools are giving the kitchen a more modern farmhouse feel these days and we are absolutely loving it! 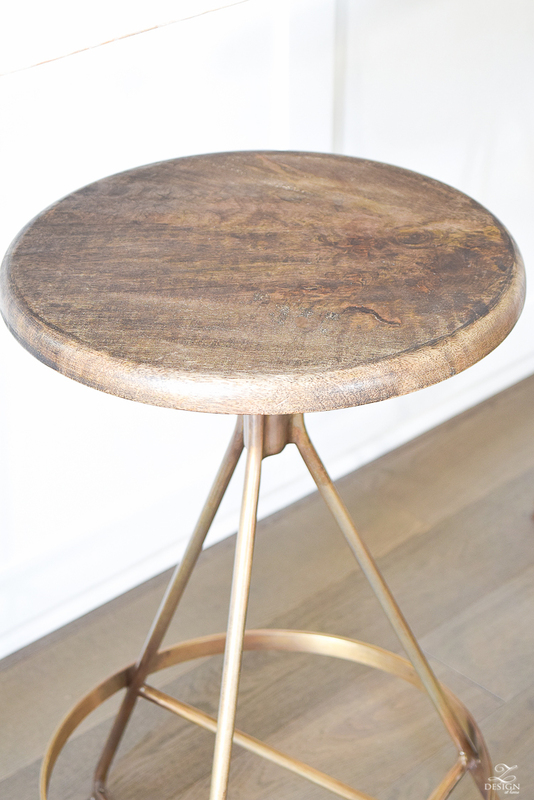 And truly, the first time I laid eyes on this stool I was completely smitten! I also love the foot rest. It certainly makes a stool more comfortable when there is a spot for your weary feet to rest. The bar stools arrived in just two days with free shipping from Wayfair.com and also came with pads to put on the feet so the floors won’t get scratched. I also love that they aren’t too shiny of a brass and are just the right shade of brass color. 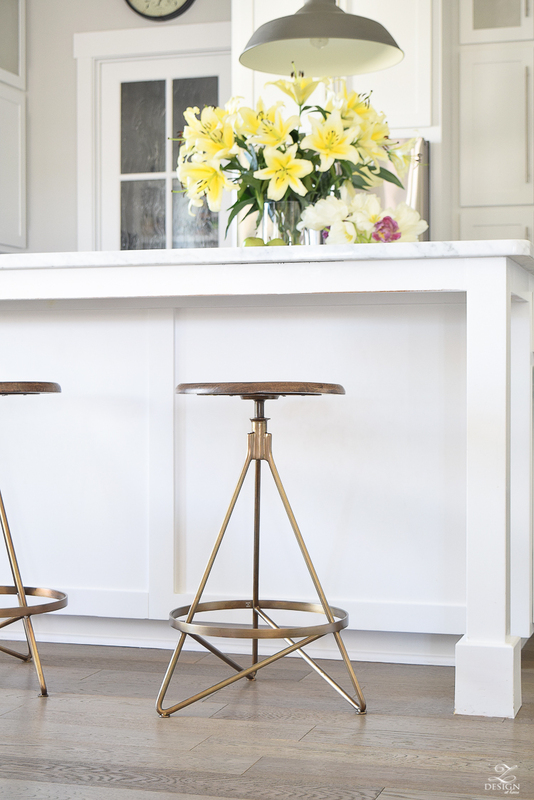 I hope you like them as much as I do and if you are looking for barstools, in addition to mine, I’ve rounded up several other similar stools to help give your kitten that modern farmhouse look and feel. 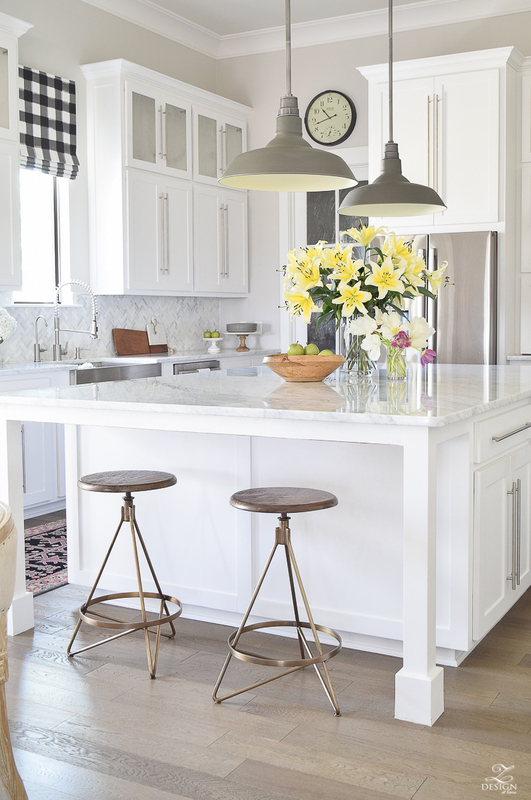 All of these stools would be nice in any space and are perfect to help achieve that modern farmhouse feel in your home but would really give any kitchen an updated feel. I love each and every one of these and ultimately had a hard time narrowing it down but all of these would have been great in my space! 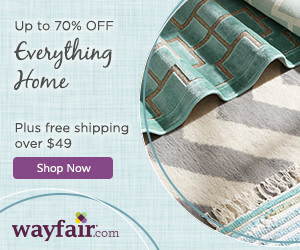 **This post was done in partnership with Wayfair.com but as always, all opinions are my own. « Pink and Perforated – OH MY!! Love them ! They’re beautiful ! What Is your counter height ? 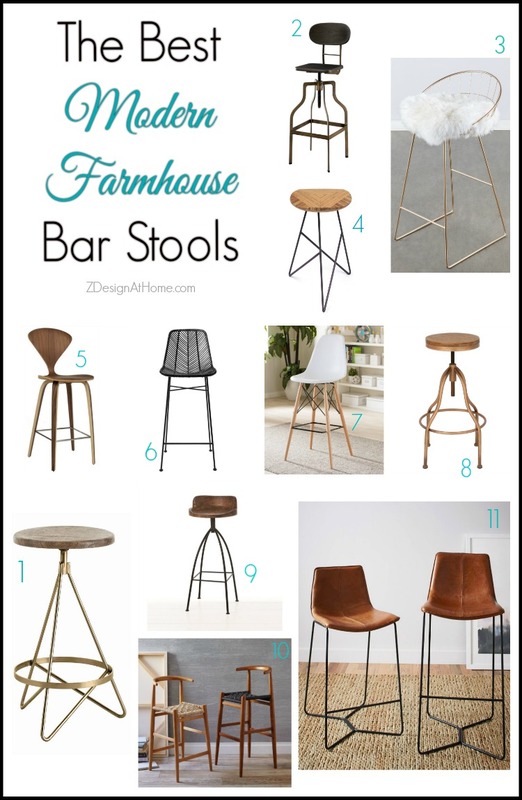 Bree – Absolutely love your choice in barstools! 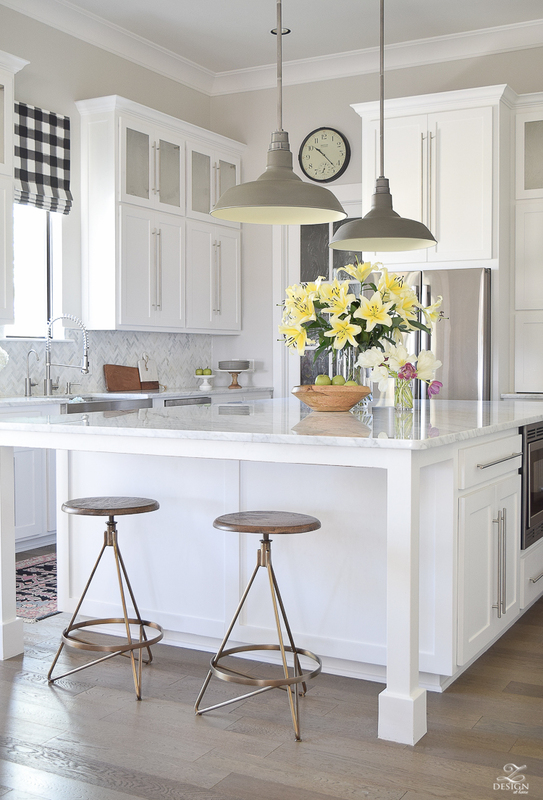 Love that modern farmhouse look! I’ve been looking for new stools for quite some time. Such a hard choice! 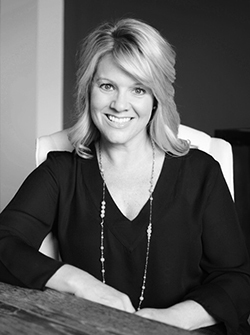 So glad I found your blog not long after you started…you inspire me in so many ways! 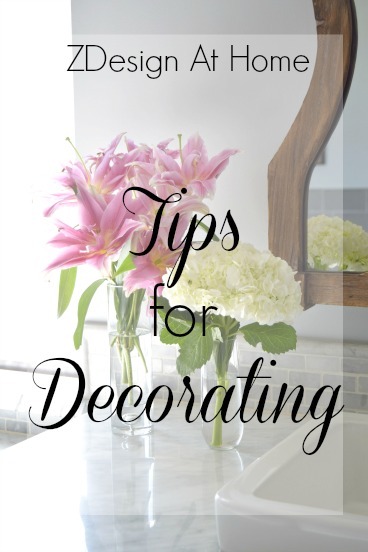 Not only because you have such a beautiful eye for decorating but you inspire me to consider options I wouldn’t normally have looked at! One of my favorite bloggers! 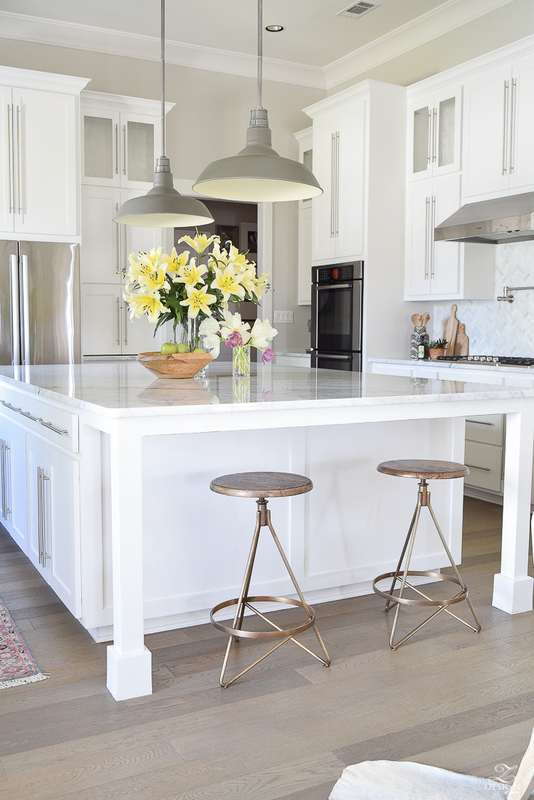 I love your kitchen, and I like the stools. 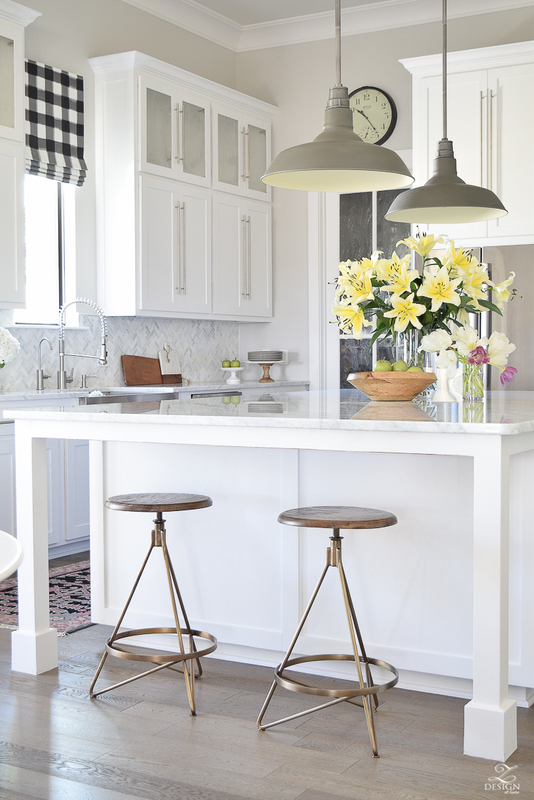 However, I don’t think the stools carry enough visual weight for the space. I think they are lacking in scale and interest to compliment the other lovely choices you’ve made in the room. But, if you and your husband love them, that is all that matters! Enjoy! Bree, these bar stools are amazing!!! Excellent choice with the antiqued brass. So, so pretty!!! They are beautiful Bree! I’m so glad you finally found stools to replace the old ones. 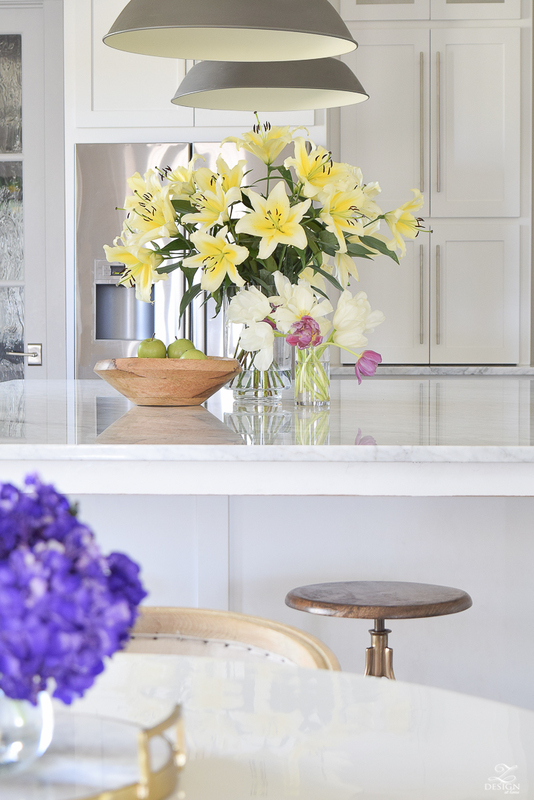 Your gorgeous kitchen continues to be one of my favorites!! !